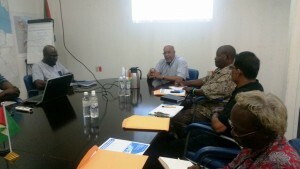 “Our sanitation employees are alarmed by the amount of medical waste found in the GWI sewage tanker as well as sewage chambers outside of some hospitals,” GWI Chief Executive Officer, Dr. Van West-Charles told representatives of the several hospitals who were summoned to a meeting last Friday to discuss the situation. “The health and safety of our employees cannot be compromised in any way, hence the reason for the meeting with all the hospitals; we must find a swift solution to this problem and protect the health of GWI’s sanitation employees,” he was quoted as saying in a statement. Those attending the meeting with Van West-Charles were and representatives from the Georgetown Public Hospital Corporation, St. Joseph Mercy Hospital, Woodlands Hospital, Davis Memorial Hospital and Balwant Singh Hospital. “The purpose of the meeting was to discuss the disposal of medical waste following complaints by GWI sanitation employees about coming into contact with needles, syringes, discarded medical bandages and other forms of medical waste while executing their duties,” said GWI. The GWI Chief Executive explained that he recently met with all the employees of the Sanitation Department who described several alarming instances in which medical waste was discovered while cleaning sewage blockages or clearing overflows at various medical institutions within Georgetown. Another instance included a sanitation employee stepping on used needles while attempting to clean the GWI sewerage tanker. “This situation is unacceptable,” stated Dr. Van West-Charles. “I am asking that every medical institution review their practices with regard to the disposal of medical waste and that there be some significant changes in adhering to all guidelines that relate to the proper disposal of medical waste,” he said. Dr. Van West-Charles urged all the representatives present to examine if there are breaches in adhering to guidelines which stipulate how to correctly dispose of medical waste and take corrective action. The Chief Executive also indicated that he will be engaging the Chief Medical Officer (CMO) on the matter and more discussions will be held to resolve the issue. More than 10 years ago, the United States Agency for International Development (USAID) had supported a safer injection project that had focussed on, among other things, the globally accepted best practices for the safe disposal of needles and syringes.